In the Footsteps of Saints and Martyrs | Where's Fran? Dr. Takashi Nagai was working with patients in Nagasaki when the A-bomb was dropped on August 9, 1945. For the next three days he worked furiously helping those who could be saved and gathering the remains of the dead. When he was finally able to return to his own home, he found a charred pelvic and spine, all that was left of his wife who died in the blast. Once he laid his wife to rest, he continued his service to the victims. Partly as a result of exposure to radiation, Nagai soon became bed-ridden–but that didn’t stop him from carrying out his mission. He wrote 13 books on world peace, planted 1000 cherry saplings on the site of the bomb explosion to turn a wasteland into a “Hill in Bloom,” as he put it in one of his books. Where others might have hardened their souls in bitterness, Nagai’s life became a prayer for peace. “Love others as you love yourself” was the only advice he gave his two children before he died in 1951 at the age of 43. Sounds like a genuine saint to me! While in Nagasaki, I lived in a small Jesuit house situated on a hill on which 26 martyrs were crucified in 1597. They included three Jesuits and six Franciscans. These 26, now canonized as saints, are just a few of the horde of Christians, most of them concentrated in Nagasaki, who were victims of the shogunate persecutions. In all, a quarter of a million Christians were killed before the persecution ended. The popular movie “Silence” is the story of two Spanish priests who go out to Japan during the height of the persecutions, partly to atone for a priest who renounced his faith a few years earlier. I also visited the museum dedicated to Shusaku Endo, the author of the novel on which the screenplay was based. The Christians who were not killed outright during the persecutions went into deep hiding, usually in the steep interior. They hid their medals and rosaries and prayed silently for fear of raising the attention of the Shinto and Buddhist population. “Silence” pretty much describes the ambiance of these communities, who grew whatever little they could on the hilly terrain and were denied safe access to the sea for fishing. “Dirt poor” is another way to characterize the people who took refuge in these hidden communities. 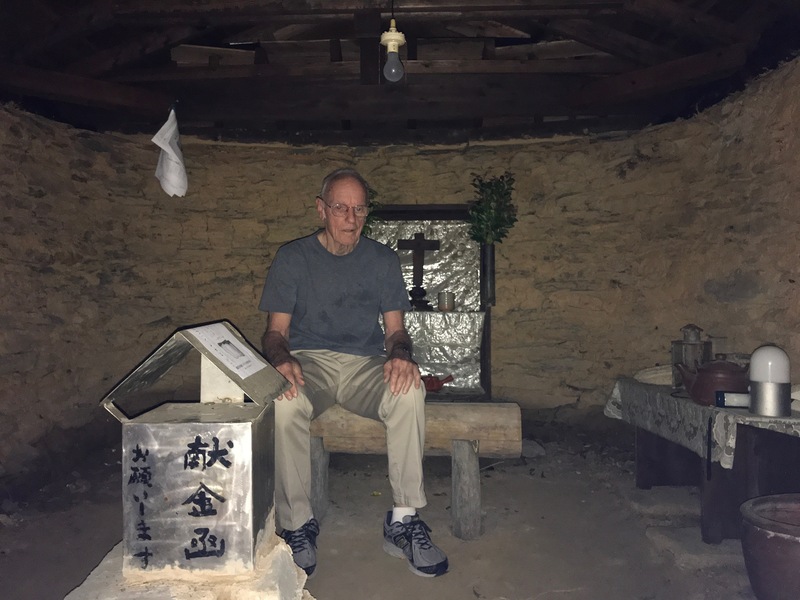 We saw some of the shrines at which they worshiped as well as the churches they were finally able to build at the end of a persecution that lasted 230 years. Nagasaki has no shortage of heroes. Christians by the hundreds were wrapped in heavy mats and thrown into the sea. The more unlucky were hanged upside down over lime pits until they expired several hours later. The young were killed along with their parents. One local ruler, or daimyo, abdicated his title and surrendered his land rather than give up his faith. Bastian, revered as something of a saint, was said to have instructed his fellow Christians on how to live during the persecutions. Fr. 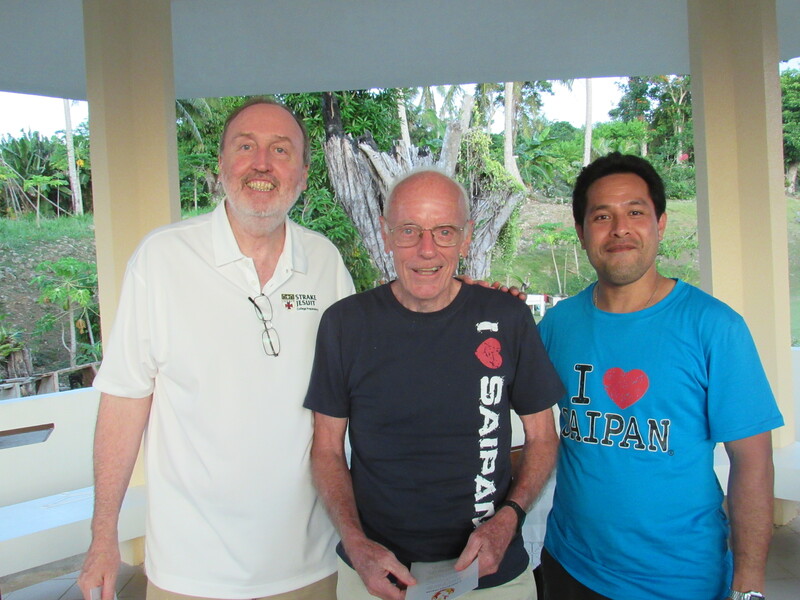 Marc de Rotz, a French missionary, is credited with rediscovering the hidden Christians in 1879, leading them out of the wilderness, and initiating development programs on their behalf. Curiously, Hidden Christian Sites in Nagasaki has recently become a World Heritage site. 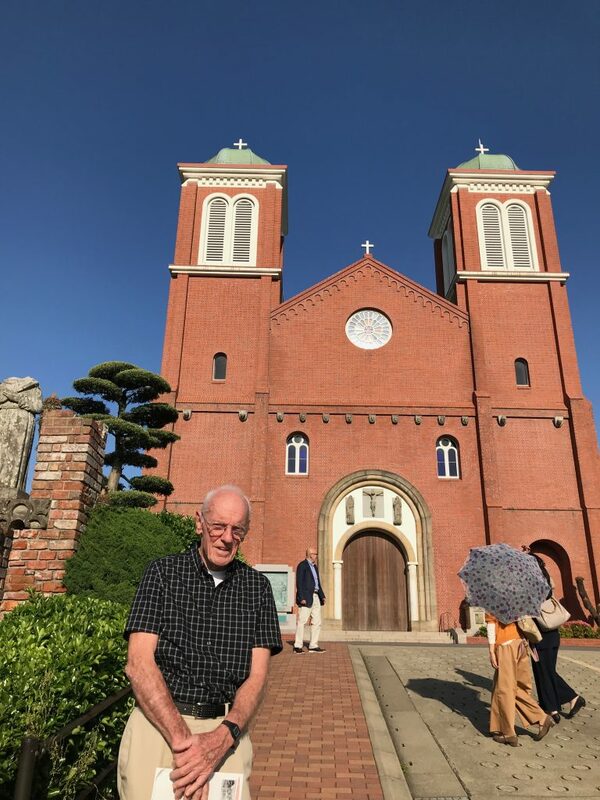 Standing in front of the Urakami cathedral, the place where the hidden Christians were discovered by French priests after the persecution ended. Once the Christians emerged from hiding, they began collecting funds to build a cathedral–a monument to the liberation they experienced. The Urakami cathedral was completed in 1914 as a proud display of the religion that had remained underground for so long. 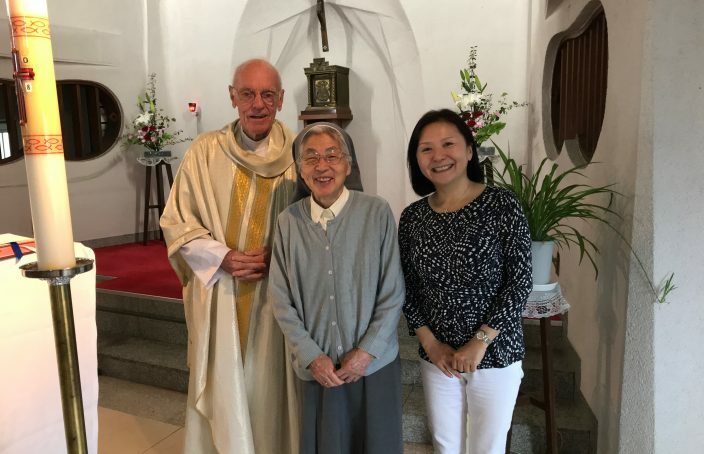 But the Christians of Nagasaki had only 31 years to worship there before the building was leveled by the bomb that exploded just a few hundred meters away. So much suffering and sorrow, but so much selflessness and love! I’d like to think that you don’t have to be a Jesuit to be inspired by Nagasaki and what it represents.